Vivaldi, Antonio, (1678-1741), Italian composer and violinist, the most influential of his age. Vivaldi was born March 4, 1678, in Venice, and was trained by his father, a violinist at St Mark's Cathedral. Ordained a priest in 1703, Vivaldi began teaching that year at the Ospedale della Piet�, a conservatory for orphaned girls. He was associated with the Piet�, usually as music director, until 1740, training the students, composing concertos and oratorios for weekly concerts, and meanwhile establishing an international reputation. From 1713 on, Vivaldi was also active as an opera composer and producer in Venice and travelled to Rome, Mantua, and elsewhere to oversee performances of his operas. In about 1740 he accepted a position at the court of Emperor Charles VI in Vienna. He died in Vienna on July 28, 1741. Vivaldi's works include more than 500 concertos and over 70 sonatas; about 45 operas; and religious music, including the oratorio Juditha Triumphans (1716), the Gloria in D (1708), masses, and motets. His instrumental sonatas are more conservative than his concertos, and his religious music often reflects the operatic style of the day as well as the alternation of full group and soloists that he helped establish in the concerto. His somewhat younger contemporary, J. S. Bach, studied Vivaldi's work during his formative years, and some of Vivaldi's violin concertos and sonatas exist only as transcriptions, mostly for harpsichord, made by Bach. 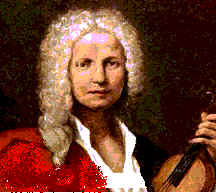 Vivaldi's concertos provided a model for this genre throughout Europe, affecting the style even of his older contemporaries. Over 300 of his concertos are solo concertos (220 for violin, others for bassoon, cello, oboe, and flute). Others are concerti grossi, 25 for two solo violins and 32 for three or more instruments. A few are ripieno concertos (for orchestra without soloists). Vivaldi was himself a virtuoso violinist who astounded listeners with his technique. Through this he helped establish one of the primary characteristics of the concerto in the centuries to come: its use as a vehicle for the virtuoso display. The violin concerto also strongly influenced the evolution of violin technique in cross-string writing and the development of different bowing technique. Vivaldi was the first composer who consistently used the ritornello form that became standard for the fast movements of concertos. The ritornello was a section that recurred in different keys and was played by the full orchestra. It alternated with soloist-dominated sections (episodes) that in his works were often virtuosic in character. He virtually established the three-movement format for the concerto and was among the first to introduce cadenzas for soloists. His opus 8 violin concertos entitled The Four Seasons are early examples of programme music. Like much of his music, they are marked by vigorous rhythms and strong contrasts.